The term encaustic derives from the Greek word enkaustikos which literally translates to "to heat" or "to burn". 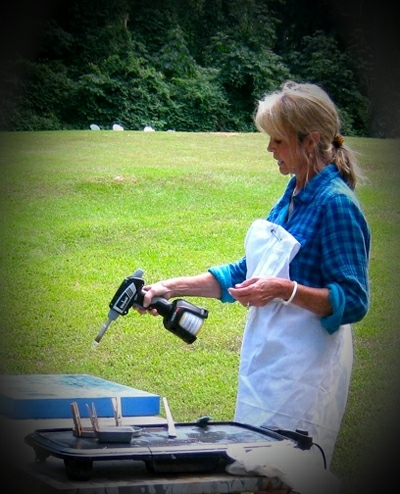 Encaustic painting technique is an ancient method of painting that began in the first and third centuries. The Greeks often used it for mural painting. The earliest and best-known examples of encaustic are the Fayum mummy portraits from Egypt (C100-300). These works are on display at the Metropolitan Museum of Art and are so vibrant you can hardly fathom that they are ancient art. Encaustic disappeared from history over time and resurfaced with Jasper Johns work. Encaustic paint is a combination of beeswax, damar resin (from tree bark) and pigment. The paint is melted on a warm palette and applied to warm surfaces. Each layer is fused to the layer before with a heat gun or torch. A variety of techniques can be applied to the surface with the temperature controlled tools. The substrate recommended is wood, but I have been experimenting with other surfaces and would eventually like to try using it over sculptures of clay. I have always loved the luminous quality of encaustic work. After seeing paintings at the Museum of Cairo in Egypt in 2010 I was determined to at least try my hand at it. 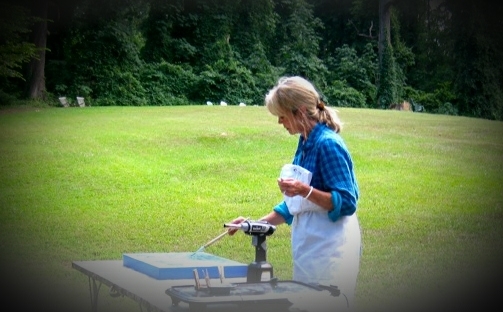 I took a workshop in the fall of 2011 with an encaustic artist to learn the basics of the material and the necessary safety precautions (and there are some). Since that time I have been working consistently and plan to study this summer at THE ENCAUSTIC INSTITUTE in New Mexico. It is very challenging but I learn new possibilities with encaustic painting each day.